We are back and going hard for our Queens of the world! This issue is all about the P.O.P. : THE POWER OF THE P! Women's Encouragement, Enlightenment and Empowerment on the World! 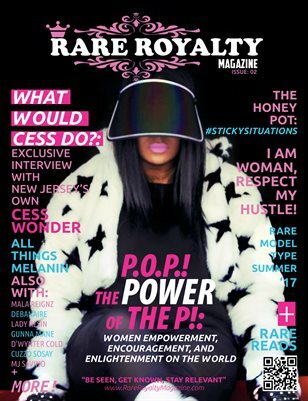 Cover features include Bronx Bad Girl, Mala Reignz and Roc Nation Superstar, Cess Wonder. Also we are showcasing our Summer '17 edition of Rare Model Types and giving you a dose of new topics, editorials and Rare Reads. Please continue to support the movement anda always wear your crown well!